The conservation issues surrounding our oceans seem so vast as to be utterly impossible to tackle. It’s easy to look at a problem, such as overfishing, and think there’s nothing I could possibly do to help combat this. There’s nothing, a single person could possibly hope to achieve. We think, we are nothing more than a drop of water in the boundless waves of the sea, and thus how could we ever hope to turn to tides. But we can. Because even something as small as turning off the lights or opting for sardines instead of tuna makes a difference. One thing that I think a lot of people struggle to conceptualize is this idea of demand. We know that sockeye salmon are endangered, and yet we still eat them. We still buy it at the store. Why? Because we think, well, it’s already dead anyway. If I don’t buy it someone else will. But this is merely a trap of apparent logic. Because this is not how the economy works. The reason why that fillet of fish is in the store is because there is demand for it, you purchasing it, is telling industry there is a demand for it. And so, like any good business model, they will continue to supply it. If every person who walked by it decided that they would go for a more sustainable option, they’d have a bunch of salmon left at the end of the day. If this happened consistently, that company would consider stopping, or at least reducing the supply of it. If there’s no demand the supply will fall too. So the next time you see something in the store, or on the restaurant menu that you know is an unsustainable choice, opt for something else. Take that first step in reducing the demand. A common thread runs through many of these “green choices”, namely that they might seem rather insignificant. You might think running a carpool instead of driving solo couldn’t possibly have much of an effect. Turning off the lights when you leave a room, or turning off the tap while brushing your teeth is hardly worth the effort. But when it comes to our planet, it needs every little iota of help it can get. And what’s more, it’s not only about your small action, it’s about the message you send out to others. It’s about those conversations that will be prompted by your choices. Those conversations that will hopefully convince others to make those same small choices. OceanCare has launched a campaign I Care, which deals with this very concept. Empowering the everyday person to do more, and feel like they really can make a difference. This project strives to educate people on the harmful effects of plastic on the ocean and its inhabitants, and encourages every single one of us to re-evaluate our own use of it. Our own relationship with this disposable and material world we live in. On their site there’s an option to sign a pledge to give up one aspect of this harmful habit i.e. avoiding plastic bags at the supermarket, plastic straws, PET bottles, non-reusable coffee cups, and microplastic beads found in cosmetics. Many of these products end up in the oceans, accumulating in large gyres which ultimately form massive islands such as the Great Pacific Garbage Patch, which is now three times the size of France. They also offer sustainable alternatives, such as reusable bags to store vegetables, and water bottles. Perhaps the most promising thing about this all, is just how easy it is to do. All you have to do is toss a reusable cup into your bag before going to work, buy a shampoo which doesn’t have micropearls, or bring a water bottle instead of buying a PET bottle at the store. These are things that will not vastly change your lifestyle, and in a matter of days it will become second nature to you. It’s so easy so why wouldn’t you want to do your part in helping save the seas? And if you still don’t want to, think of what you would tell your grandchildren when they ask why you couldn’t do something as simple as buying a reusable cup? What story would you tell them? Would you be able to look them in the eye and tell them you didn’t think their future was important enough to spare a couple seconds a day washing a cup? I will leave you with one final note. Namely, that I think every single person should do their part in rectifying the grievous wrongs we have committed towards out planet, whether that be not using a plastic straw, or lobbying politicians to fund a new marine protected area. Every single action, no matter how big or how small is important, and never think that anything is insignificant, for that turtle who now doesn’t find himself with a straw stuck in his throat will certainly thank you. But I think it’s also important for everyone to understand that our oceans are quickly running out of time. Ocean pH levels have dropped in a mere 7% of the time it took them to drop the same amount during the Permian Mass Extinction, which saw over 90% of species on earth vanish into history. Tuna stocks, and most other commercially fished species are predicted to collapse in 2050. These predictions are no longer centuries in the future. They are no longer something our children’s children will have to deal with. These predictions will come true during our lifetimes, and some of them are already coming to pass. So though it’s important to stress these little lifestyle changes, I also want to implore you, that if you can do something more, do it. If you have connections, use them. If you have a vast social network, spread the word, tell others about what you know. If you know someone who has the power to do something, tell them to. If all you can do is use a reusable cup instead of buying one every day, then that’s fantastic. But if you can do more, don’t settle for doing the minimum. Don’t settle for assuaging your guilt, and do everything in your power to save what is left of our home. Because if you wait too long, there might not be much left to save. 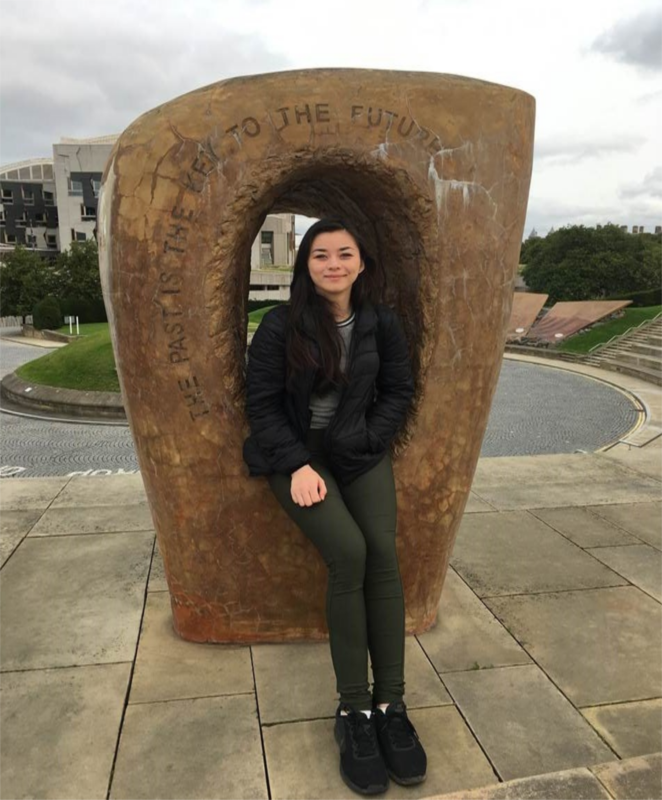 Sophie is currently a student at the University of Edinburgh studying environmental chemistry. She plans to specialise in marine chemistry, with a tentative focus in how ocean acidification affects marine megafauna during her graduate work. Sophie has been supporting OceanCare for many years – thanks a lot!